OK--I got in a bit over my head with this one! I just got my new Pentel Pocket Brush yesterday (YAY!) and was really hot to take it out for a spin with today's blog entry. 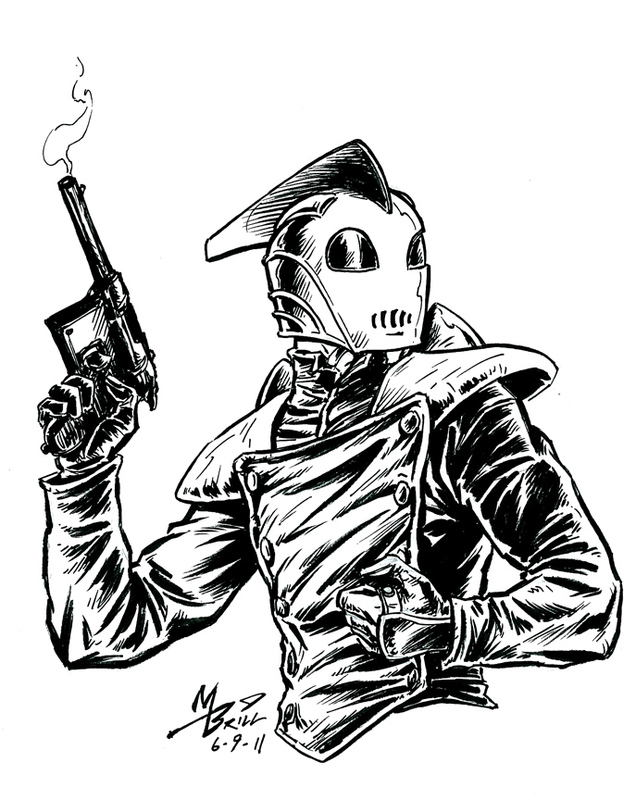 So I was thinking about brushwork and I thought, Dave Stevens has beautiful brushwork...I should do The Rocketeer to test drive my new brush-pen! Well, YIKES! He looks so simple, but he's really complicated to draw correctly! Never mind then taking the time to do nice brushwork! I probably should have started with something more organic and loose. In any case, here it is; my first ink sketch using my new pocket-brush! Oh--it took pretty much my whole lunch hour!! WAAAAAY too long, of course. Great job on the brushwork! The jacket looks amazing. What exactly is a Pentel Pocket Brush?